This is one of our annual favorites here at ChiIL Mama and ChiIL Live Shows. Come on out for a free, family friendly, outdoor sampler of Broadway In Chicago tunes from some of the top musicals of the decade, performed by cast members and hosted by Janet Davies of ABC 7. It's truly a treat and free for all. 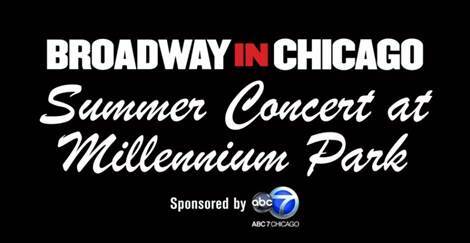 Broadway In Chicago is thrilled to announce the full concert line-up at the annual FREE BROADWAY IN CHICAGO SUMMER CONCERT, sponsored by ABC 7 Chicago and hosted by Janet Davies, ABC 7 Chicago’s entertainment reporter and host of the entertainment and lifestyle program 190 NORTH on ABC 7. The concert will take place on Monday, August 15, 2016 at 6:15 p.m. at the Jay Pritzker Pavilion at Millennium Park (201 E Randolph St). The Broadway In Chicago Summer Concert at Millennium Park is presented with the City of Chicago Department of Cultural Affairs and Special Events. This year there will be performances including Disney’s ALADDIN, BEAUTIFUL – THE CAROLE KING MUSICAL, THE BODYGUARD with Grammy® Award-nominee and R&B superstar DEBORAH COX, FINDING NEVERLAND, the 2015 Tony Award®-Winning Best Musical FUN HOME, the 2014 Tony Award®-Winning Best Musical Revival HEDWIG AND THE ANGRY INCH featuring composer and lyricist STEPHEN TRASK, Rodgers & Hammerstein’s THE KING AND I, Cameron Mackintosh's spectacular new production of Andrew Lloyd Webber’s THE PHANTOM OF THE OPERA, the completely original new musical comedy SOMETHING ROTTEN! and STOMP. Presented in collaboration with the Department of Cultural Affairs and Special Events as part of Millennium Park Presents. Millennium Park proudly presents symphonic music, dance, opera, Broadway hits and more—performed by some of Chicago’s best-loved cultural institutions. For full calendar information, visit millenniumpark.org. For exciting facts about the Park, program updates and weather cancellations, follow on Twitter (@Millennium_Park) and Instagram (Millennium_Park) and like Millennium Park on Facebook.